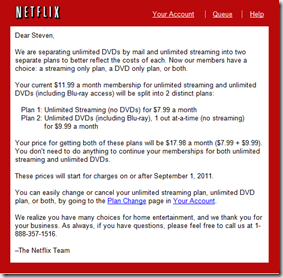 Netflix Price Increase - It is good for Netflix, but is it good for you? First, we are launching new DVD only plans. These plans offer our lowest prices ever for unlimited DVDs – only $7.99 a month for our 1 DVD out at-a-time plan and $11.99 a month for our 2 DVDs out at-a-time plan. By offering our lowest prices ever, we hope to provide great value to our current and future DVDs by mail members. New members can sign up for these plans by going to DVD.netflix.com. Currently my dilemma lies in that I am not a huge streamer, but my family shares my Netflix account and use it exclusively for that. I prefer the DVD service for new titles, more exact I have paid the extra $2 for the Blu-ray Disc option and like the quality to view the maximum what my television can produce. I have been a Netflix subscriber for years and their turn around time has never failed to impress me on sending out movies in disc format. Occasionally, I will stream a movie via my phone, tablet, game console, or laptop when traveling, but that hasn’t been as often as it was in the past, but I have loved the ability to do so, when needed. Last year I rolled back my 2 discs out at a time to just 1 because there was just nothing to ship in my queue. As of late over the past few months it has gotten even worse, Netflix has unfortunately at the request of many movie companies particularly Warner Bros, to have a moratorium on offering new titles so the company can increase the small window of DVD/Blu-ray sales that Netflix great renting service has put a serious dent in their sales. Have the movie studios actually seen this be effective? We don’t know, since there are several other options for consumers to get that next day content RedBox, Pay Per View, Amazon Video On Demand, Blockbuster, Apple iTunes, Zune and my personal favorite as of late VUDU, which offers Blu-Ray quality streaming rentals the same day of disc release titles for a mere $2 for a 48 hour rental, much better than the competition as of now for me with no wait time. I used to be a huge consumer of DVDs and have a collection 3 shy of 900 titles not including the few Blu-Ray titles that I got to have. I am a huge fan of DVD extras and can watch movies over again when the mood fits. 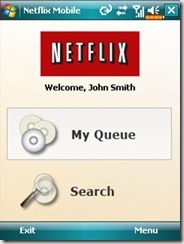 Currently my Netflix queue has been in a stall with the turn around time being delayed not only by release date delays imparted by the studios, but also due to the shear volume of requests for titles and the availability of those limited discs in my local Netflix distribution center, where the status says short wait, long wait, and the dreaded very long wait(which many titles as of this week were glaring back at red at me) until a few just became available. My Queue hasn’t really moved in the past few months and my family and myself will just throw a title in there just because the delay and activity of turn around time has been, well slow compared to other options available. 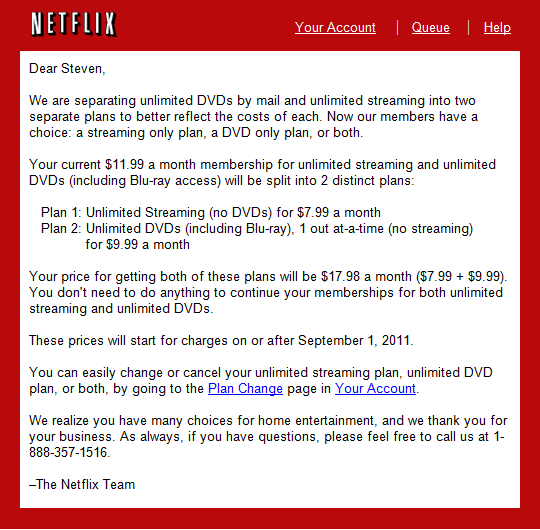 Due to the quality of the turn around time of newer releases, I have been contemplating just cancelling my Netflix subscription, first it was just going to be the DVD/Blu-Ray portion only and now that the content of titles in Netflix’s streaming library has really “stunk” as of late and with the current price increase this may be the reason to finally push me over the edge and cancel it entirely. I have until September to make this decision, so I am hoping the folks at Netflix will be offering more streaming content to make it worth while to keep and improve the DVD release dates with the studios to make it worth having rather than going to a more instant option. I understand that this all requires money to make this happen and that may be the reason why Netflix is going this route to add more value for its customers and hopefully improve, but they are at the mercy of movie studios, who also want to increase their coffers so they can make the movies and content we all love as well as a profit. It is a tough quandary to be in as a consumer who loves the service, but it doesn’t seem the service has been returning the same love to the consumer as of late. I hope we all see a turn around or we may see Netflix’s great model and customer service be replaced by another who does and go away like the brick and mortar stores they slowly closed over a period of a few years. At CntrStg we got to see and play a little with a new application for Windows Mobile in a presentation by Greg Sullivan called Mobile Manager for Netflix. 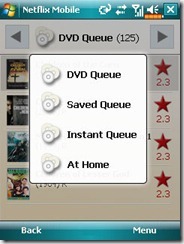 Not only can you get all the usual information on the movie, you can even view small trailers of the movie you want to add to your queue so you can sample if you really want it or if it is appropriate for your family and add it to your queue. A feature exclusive to Windows Mobile is the ability to play previews right on your Windows Mobile device. After watching a preview, you can then add the movie to your Instant Queue so you can instantly watch the movie on your Xbox 360. 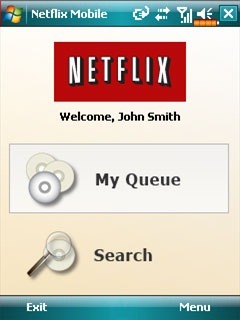 Managing a Netflix account while mobile has never been easier, thanks to Mobile Manager for Netflix and a Windows Mobile phone.